All campus and community members are invited to join in UC San Diego’s 17th annual Black History Scholarship Brunch. This annual fundraiser, to be held on Saturday, Feb. 23, spotlights the work of student scholars and supports undergraduate scholarships. The event will include a keynote talk, silent auction, live music performance and Southern-style soul food brunch. All proceeds from the silent auction support undergraduate scholarships, enabling ambitious and motivated students to realize their academic dreams at UC San Diego. The celebration of Black History Month 2019 is made possible in part by US Bank. Event highlights include the following. All event details can be found at blackhistorymonth.ucsd.edu. Feb. 5, 8 – 9 p.m., ArtPower presents Leyla McCalla: Multi-instrumentalist Leyla McCalla is deeply influenced by traditional Creole, Cajun and Haitian music, as well as American jazz and folk. Her latest album, A Day for the Hunter, A Day for the Prey, explores issues of social justice and pan-African consciousness. 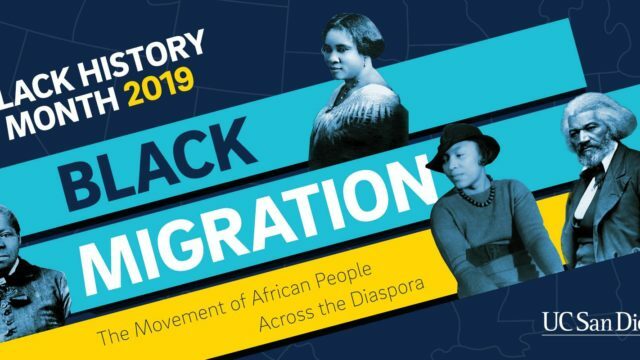 Feb. 13, 11 a.m. – 8 p.m., 22nd Annual Black History Celebration: Poetry and Migration: This all-day luncheon and celebration will feature art, music, dance, spoken word, a special themed menu and raffle prizes. Feb. 14, 3:30 – 6:30 p.m., Film Screening of “An Opera of the World” and Lecture by New York University Professor Manthia Diawara: Malian filmmaker Manthia Diawara reflects upon the perils of south-north migration and the hopes and dreams of refugees fleeing from Africa to Europe. Feb. 21, 3:30 – 5:50 p.m., Afro-Caribbean Dance and Drumming Workshop with Gene Perry: Master percussionist Gene Perry and his ensemble demonstrate African and Afro-Caribbean drumming and dance styles with audience participation. Feb. 23, 10 a.m. – 1 p.m., 17th annual Black History Scholarship Brunch: The scholarship brunch is an annual fundraiser to raise money for student scholarships and will spotlight student scholars and their academic success. There will be a Southern-style soul food brunch, keynote talk, live music performance and silent auction. Feb. 26, 5 – 6:30 p.m., Marshall College Speaker Series presents Alicia Garza: The co-creator of Black Lives Matter shares her ideas and vision for sparking comprehensive societal change and ending social justice, police brutality and systemic racism in America.